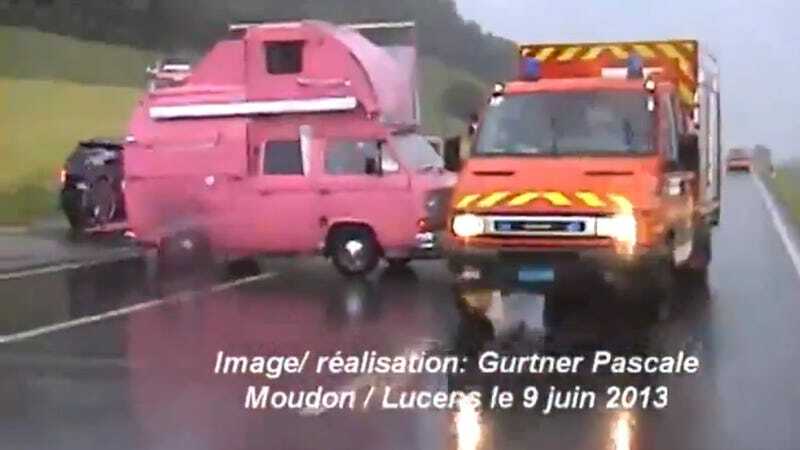 Yesterday I found a video of a train driving through a flash mudslide in Switzerland ad the universal response to the video was, forget the train, check out that hot pink camper van! Holy crap is this thing bitchin. Here's everything I can tell you about this hot pink masterpiece. It was seen in the French-speaking Broye district in Switzerland. Specifically, it was near the town of Moudon on what appears to be Highway 1. It looks like VW Type 2 Transporter van, but it's actually a three- or four-door pickup with a huge camper back. In America, we didn't get the pickup, but the van version was called the Vanagon. If it's running on gasoline, the rear-mounted, water-cooled 1.9 liter flat four is pumping out between 55 and 89 horsepower. If it's a diesel 1.6 expect something around 50. Base curb weight was 2,998 lbs without the driver or anything else. Add a few hundred kilos for all the add-ons and that horsepower figure goes from laughable to somewhat terrifying. It looks like it is wearing a hat. That's some kind of custom top, unlike the pop tops you'd get at Westfalia. I agree with Jalopnik commenters that it looks likea teardrop trailer up there. It is hot pink. That is absolutely fantastic. If you know any more about this wonderful VW, let your knowledge flow in Kinja below. Coffee Brake is where we try and shake that 2:30 feeling by making you think about things that aren't TPS Reports and don't force you to drink one of those awful Five Hour Energy things.